Not my words......I am dedicating this post to my lovely mate Mrs Hardy who gave me this mantle! 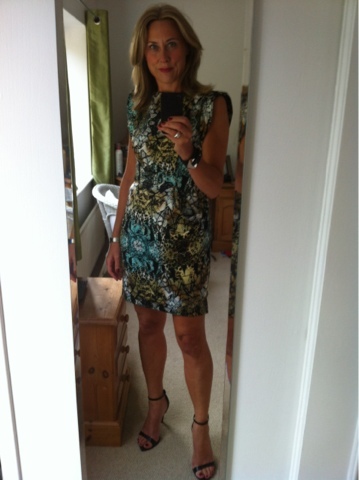 A couple of years back the lovely Mrs Hardy turned 40 and of course I was invited to her fabulous birthday lunch and pamper day at Babbington House. We have been close friends about 7/8 years since the birth of our babies who were born just a couple of days apart, although we have known of each other for more like 20 years. Anyway suffice as to say she knows me pretty well and on the day of the lunch she had made a little personalised gift for everyone in attendance (she is one very creative lady) as she wanted us to have something special to remember the day by! For every guest she had made a little plaque with a sentence to sum us up.........the above was mine! I still have this picture on display in my bedroom today as a lovely reminder of a fab day, great friend and the honour of the title of 'Michelle's vintage beats Paris fashion'. There is story behind how I came into a lot of my lovely vintage things and as a change to telling you about any retail therapy I may have participated in this week I thought I would share the tale and some photo's of my pre-loved haul. Going back a few years I visited my Uncle who lives in deepest darkest Monmouthshire! He invited me over for lunch one day as he was fully aware of my passion for fashion and had mentioned that he had lots of clothing from a house he had cleared and asked if I would like to have a look through it. 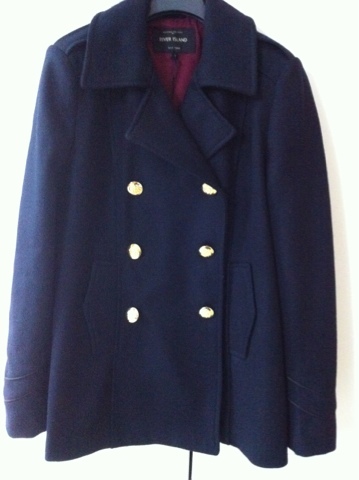 Cue a squeal of excitement from me as little did he know that I love a bit of vintage! Jeez....what a stash of booty he had!! I was like a kid at Christmas! There were 19 suitcases full of beautiful clothes!! The lady who had previously owned them had had one fabulous lifestyle which involved lots of cruising and boy did she have all the gear for it!! 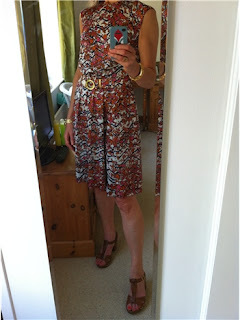 There were garments from the 60's, 70's and 80's and what's more.....luckily for me it was all in my size!! I had a huge trying on session and my Uncle very kindly said I could help myself!! 3 bin bags later I came away with some really amazing finds. So here are some photos of some of my favourites. 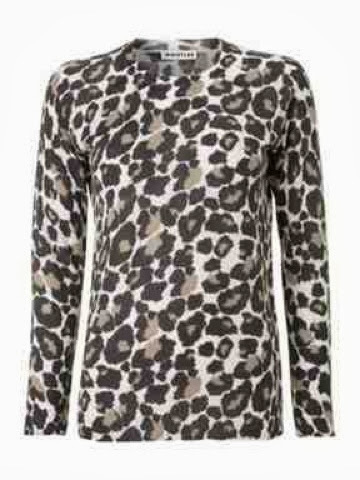 I love this quirky printed dress which always puts me in mind of a Prada type print. Next up is something you may remember seeing me in before for my wedding outfit dilemma! I always feel terribly glamorous in this! I did in fact end up wearing some vintage to the aforementioned wedding as it was quite a chilly day and I remembered this gorgeous little vintage cardy that I thought would be just perfect with the dress I was wearing! It deserves a photo all of it's own. It's so pretty, I've even worn it with skinny's and metallic pumps during the day. It's all very dressy sparkly stuff! 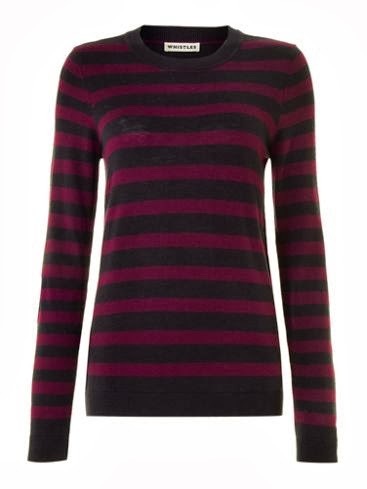 I love this Frank Usher top which has had a few outings during the party season. It's brilliant as it's so easy to bring up to date, wearing it here with pleather panelled leggings courtesy of H&M but this would look just as fab with my River Island midi pencil skirt! Some more sparkles in the way of a few evening jackets. I feel like I'm having a 'Mad Men' moment in this outfit! This one is cream and covered in pearly sequins. Last but not least is the item that I have easily had the most wear out of. The style of this coat is just so timeless and has been worn with boots and skinny's for daywear but has also totally glammed up some evening looks and has been much appreciated for the warmth in the wee hours after partying hard! You are bound to see me putting some of these pieces to good use with the up and coming party season just around the corner! Anyone else have a real passion for pre-loved? Which is your favourite item? 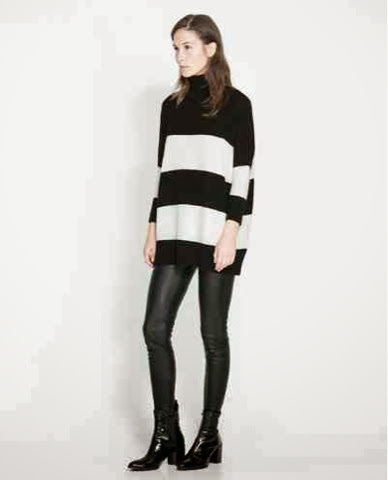 How would you style these pieces to bring them bang-up-to-date? Would love to hear your thoughts on my bit of vintage! Quick round up of what threads I've been sporting these past few days. A trip to the museum with mini-me! and all because of a code. How so? Well the lovely H&M magazine plopped on the door mat yesterday and enclosed was a fab code (0747 for online purchases) or voucher to use in store for 25% off one item!! 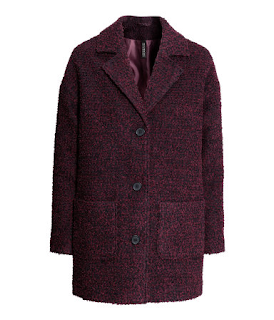 After a quick flick through the magazine I spotted this lovely coat so I hotfooted it in to town. I knew my husband would kill if I'd said I was off out to buy another coat (ahem....it's my 3rd so far this season) so you see......I am hoping to pass it off as a jacket!! Well I would have been a fool not to purchase it especially when considering that with discount it cost the grand total of just £26.24!! What's more, in store when I paid for the jacket they gave me another £5 off voucher for spends over £20 valid from 19th - 29th September! Oh happy days!! Took a picture of it in the flesh too as the H&M shot doesn't do it much justice (although upon reflection neither does mine!). H&M really do have all the coat trends covered this season!! 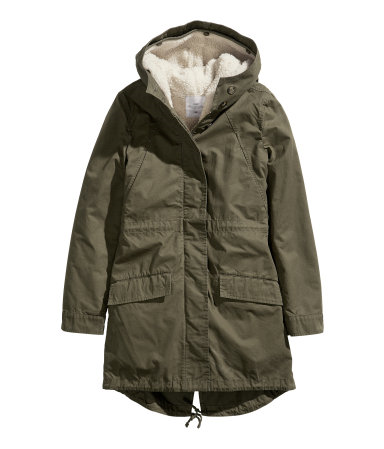 I have already secured this parka with 25% off courtesy of a previous code! Of course online and instore there are loads more to choose from so if you are in the market for a new coat (or jacket as I like to call my new purchase!!) there is plenty to choose from which are made all the more tempting with the 25% off! Happy shopping I say! Are you tempted by any of the above? Is there another style you are hankering after? Will you now be taking the plunge as there is a code floating about?? Would love to hear if you have purchased anything from H&M using the discount! I shall quickly run through what threads I've been sporting over the past few days! First up was my outfit for the big Avenue 57 meet in Brum! Have a few pics but they are totally rubbish as they are reportage styley and I haven't managed to catch anyone straight on (phew....do I hear some sighs of relief?!). 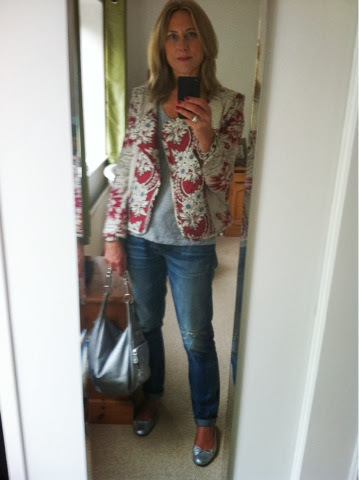 Next up was a Monday morning school run outfit.....getting a feel for the preppy vibe! 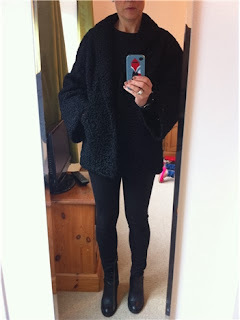 Finally an outfit in keeping with the weather which was pretty black and grey all day! Hope everyone is having a great week! There is a heatwave on it's way or so I'm told which would be sod's law as I spent the best part of yesterday changing the wardrobe over to Autumn/Winter stuff!! Look's like I shall be up in the loft over the new few days rooting around for some suitable Summer stuff to get out again.....sigh! You gotta love the British weather?! As I thought.....2 lovely pairs have come along at once. Just typical!! After trying what seemed like every shape and style I decided I wanted a soft driving shoe style loafer but couldn't decide between tan or brown......anyway these are somewhere in between!! These little beauties are courtesy of ASOS and I was over the moon when I found them in the outlet section reduced to £18! They are leather too! 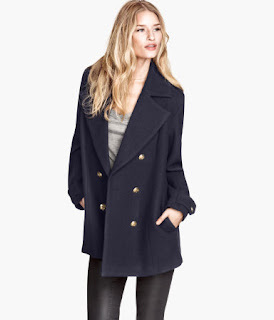 Had another success with the ASOS order as I had been on the look out for the perfect navy pea coat to complete my preppy look. My preoccupation for the pea coat started to take shape when I saw this picture of Michelle Williams sporting hers in an article about what celebrity mums wear on the school run.......if only I looked this cool! I have to say though that I think this is quite an achievable school run look that doesn't scream that you tried too hard and thankfully it's an easy style to steal. So now you can see where my fixation for the preppy look has sprung from! 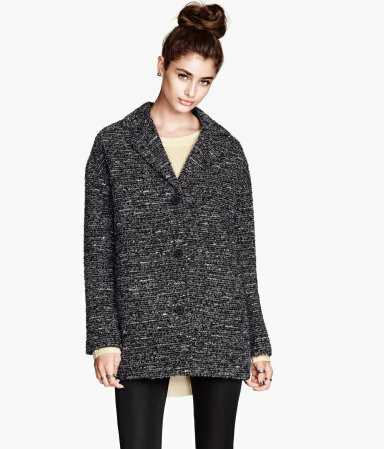 This coat is River Island from ASOS and I have to say I can't wait to wear it and start stealing Michelle's style. Which brings me back to some more loafers. So like I said I have now found not 1 but 2 pairs of loafers! Tried these on in New Look the other day, even stood in the queue with them but I was short on time and the assistant was taking an age with the customer in front of me so I left without them. Once the lovely pea coat arrived I realised I would have to hotfoot it back to New Look ASAP to grab these as they would be the perfect accompaniment to the coat as they are the same bluey-black in colour. This turn of events has meant there are a couple more additions to the now ever growing wish list. 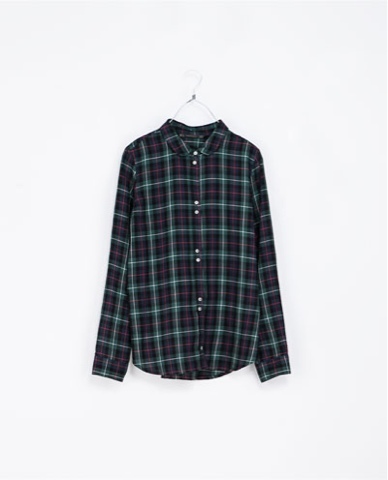 Just when I've convinced myself I don't need another stitch of clothing and all my footwear holes have been filled.....I have now become obsessed with check shirts and this one from Zara shall almost definitely be my next purchase. 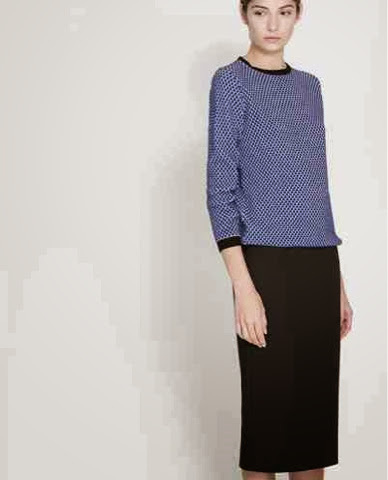 Love, love, love the Peter Pan collar on this shirt! There!! Now the wardrobe is bulging and as far as I can see I've scratched every itch clothing wise. I am preppy-ed up to the hilt! I wonder what the next infatuation will be? Only have a couple of outfits to share.....no longer going to bore anyone with the work wear, it's not worthy!! 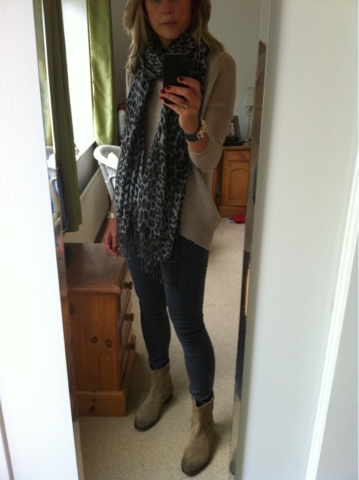 Can no longer deny the boots an airing as the temperatures are rapidly cooling!! Am off to meet lots of the lovely Avenue 57 ladies today.....am jolly excited at the prospect! Hoping to get lots more ideas and inspiration. Will report back on all the fun and frivolities in my next post! Thought I'd have a little review of what I've ticked off the wish list so far and update you on a few of my new purchases! Happy to report that I think I've found some real corkers that I'm chuffed to pieces with! Slung a M&S crew neck sweater on top......and I'm ready for college! Lol! So the original reason for the Uniqlo order was far less exciting! Still on the sweatshirt trail I ordered this in grey and black.....well at £14.90 it would have been rude not to! 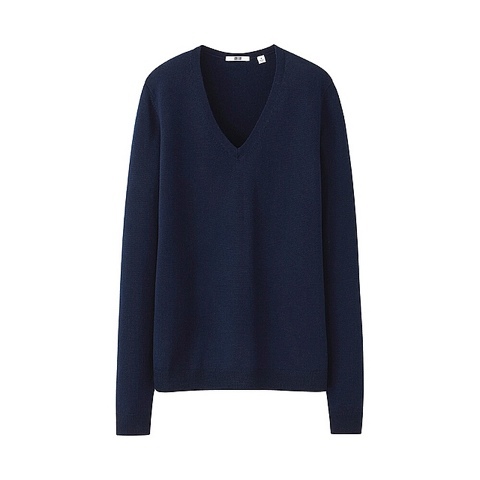 I was over the moon when this did arrive though as it is a great basic, finer than my other sweatshirts, in between a top and sweatshirt making it another great item for layering! The Brucie bonus was that it was NOT 3/4 sleeves as per the Uniqlo description!! Get in!! So after a quick fling on again, here's a pic to give you an idea! 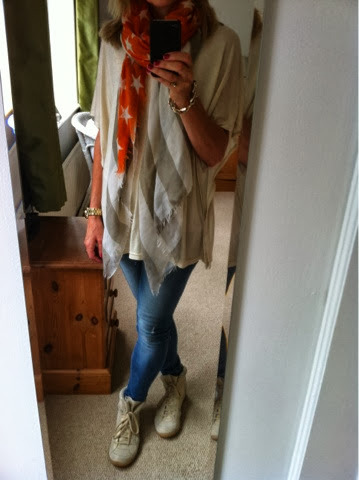 Worn here with another new purchase New Look Biker Super Skinny's and Ash Genials! So far, so very happy with this little haul! 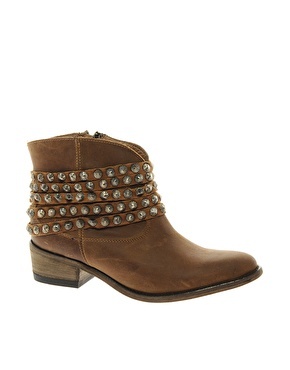 Then a free delivery on jeans at New Look came to my attention! Hands up.....I cannot take the credit for finding these!! I had already noted these jeans worthy of a look after Belinda at All Worn Out alerted me to them. I was after a charcoal colour jean but these are faded and will do just nicely so thank you lovely All Worn Out lady! 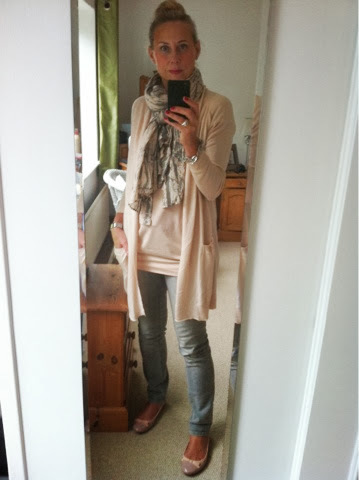 As I ordered 2 sizes of these jeans as I wasn't sure how they came up, obviously I had to take a trip to New Look to return a pair and ended up finding another little gem jewellery wise! It's taken me a while to get to grips with the whole statement necklace thing but I have been steadily building up a collection over the Summer and couldn't resit this one to bolster up my hoard! Didn't I do well with my last few buys??! Admittedly I am feeling quite smug as I've ticked a fair few things off the A/W wish list and haven't deviated too much from the original plan! So far I have managed to secure some sweatshirts, parka, boots and the cuff from my very first post! 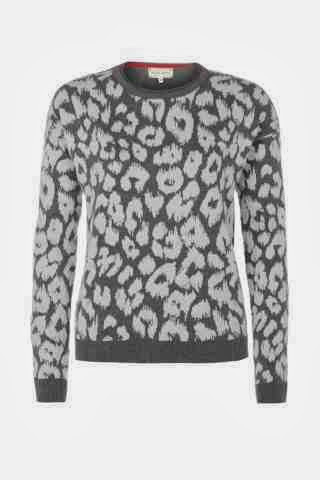 Only had one disappointment I can think off......ordered a zebra print sweatshirt from H&M which was a disaster! Pattern was too loud and the fabric looked so cheap it was returned immediately but all in all I am delighted with everything else I have acquired so far!! A few more bits have been added to this list, just waiting on an order from ASOS (more preppy-ness!) which I will hopefully be sharing next time!! The loafer shopping has proved to be trickier than I thought....not helped by the fact I unearthed a lovely pair of H&M pointy tan flats I'd forgotten about which threw me off course. 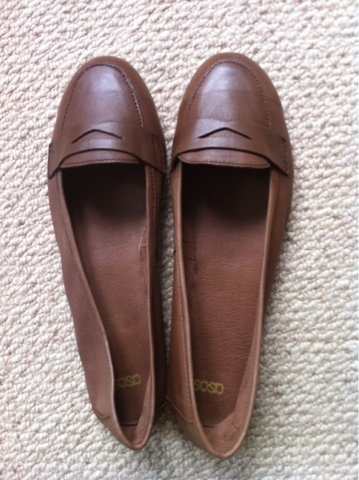 I had set my heart on tan loafers but was wondering how I could justify more tan shoes, then I turned my attention to what was on offer in brown and now I'm just thoroughly confused but I'm not giving up! I may have bought and returned 2 pairs so far but I will just keep chugging along until I find the right pair....I expect like buses 3 will come all at once!! 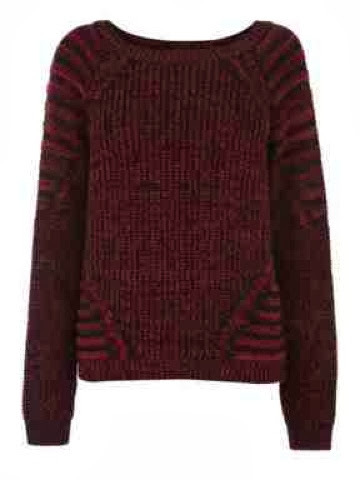 Anyway how is your Autumn/Winter wish list shopping going so far? Any triumphs or total flops to report?? Here's a short and sweet roundup of what I've been wearing since my last post! 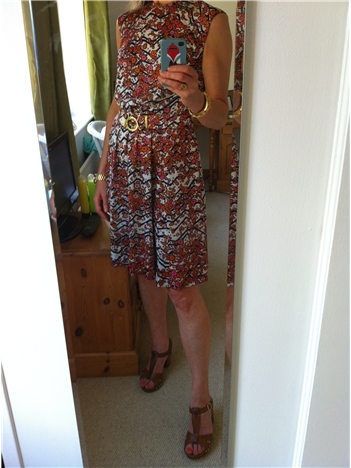 Finally, today's outfit for a trip into Bath in search of a birthday present.......a far more satisfying shopping trip than yesterday!